Yerevan the capital of Armenia and by far the biggest city in the country, it has come along way since my first visit there in 2013. Now when I was back here again in December 2017 for a short visit, it was a great joy to see how much the city has improved. It´s now a great option for a long weekend trip together with Tbilisi the capital of neighbouring Georgia. Already when arriving at Zvartnots International Airport, you will notice that Armenia is doing a good effort to welcome foreign tourists these days. The immigration only takes a few seconds, there´s a beautiful woman standing at the exit handing out free maps over Yerevan and Armenia to all arriving tourists before exiting and going through costume. There´s even a new Airport Express Bus with free WIFI that will take you to the city centre for 300 Armenian Dram, that´s 0.6 USD. not even 1 USD, that would probably make it become the world´s cheapest airport transportation. 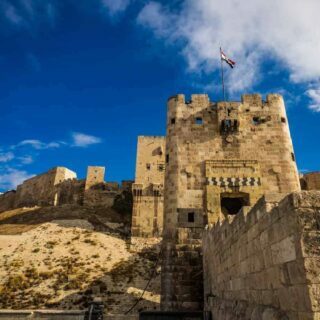 Check out this post about 50 Things you need to know before travelling to Georgia if your planning to visit Georgia after Armenia. Yerevan is small and compact, so all sites in the city can easily be visited in a day either by foot or with using the one line metro. 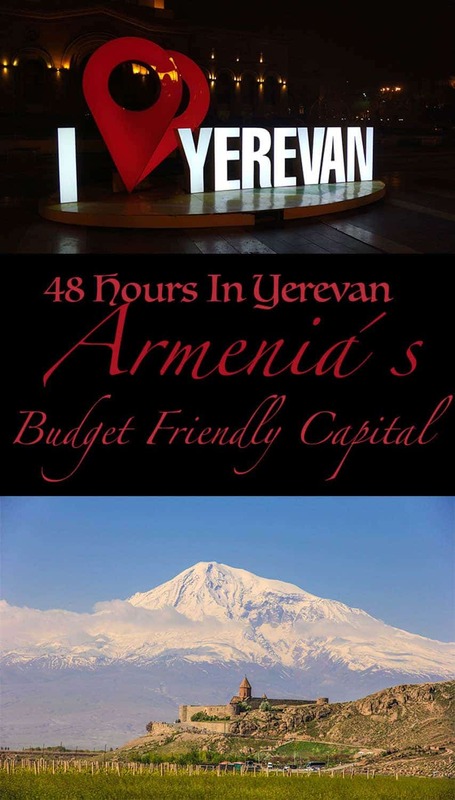 what’s more, there are endless opportunities for day trips around the capital coz of Armenia’s small and compact size. Unfortunately, during my visit in December did I experience miserable weather during my whole visit so my photos are not the best in this post. 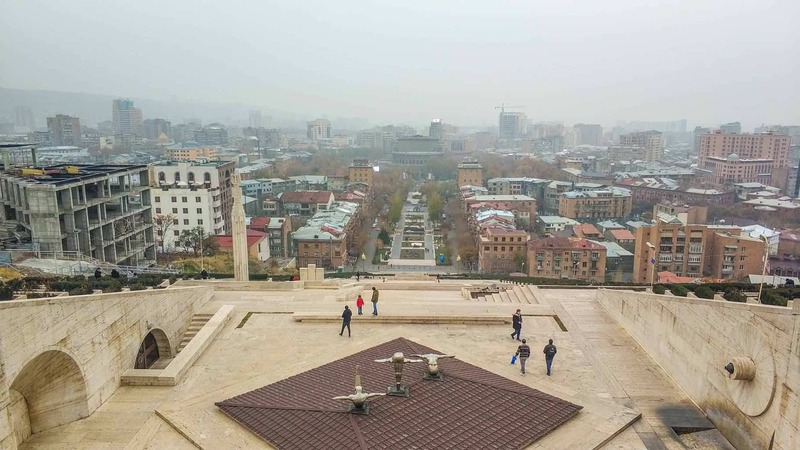 Here are The Top 7 Things To Do On Your First Day In Yerevan. The main Square in Yerevan, where the singing fountains (only in summer), in front of the History Museum of Armenia. The square is a great example of Soviet architecture. A good place to meet friends or go for people watching. There´s free wifi here. 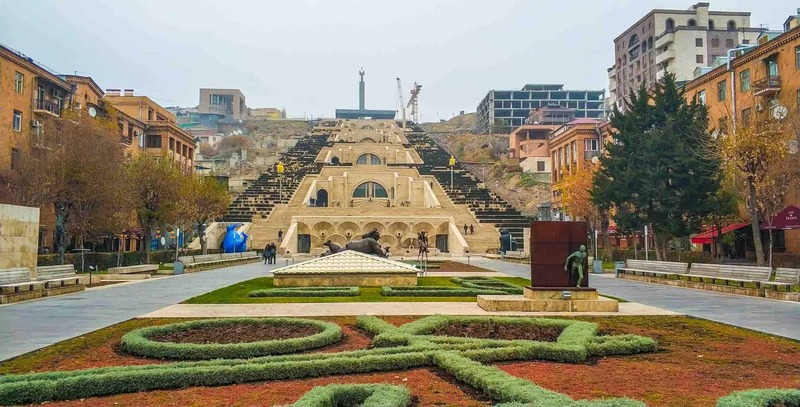 In the northern part of Yerevan is this outdoor/indoor art deco museum built as a version of the Hanging Gardens of Babylon almost the height of the Empire State Building. It’s a massive white stairway up to a hillside of northern/central Yerevan. 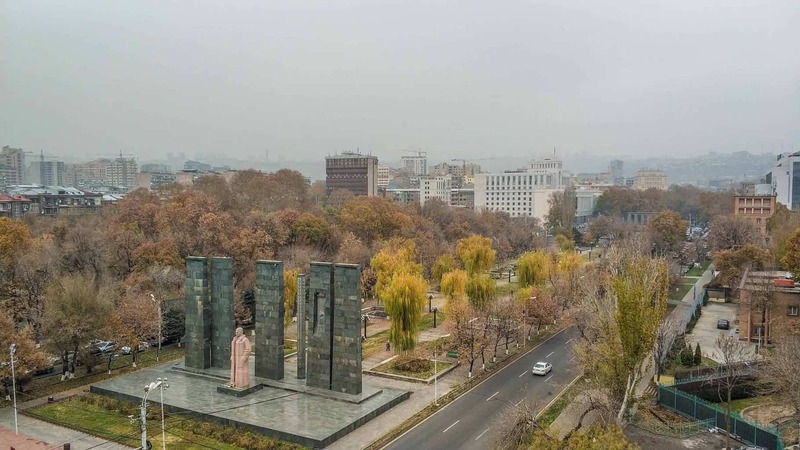 From the top you will get a full view over Yerevan with Mount Ararat in the distance. The Yerevan Cascade, outdoor art gallery. If you fancy a view with a drink so is this bar the best place to go, it´s the highest located bar in Yerevan, It´s not cheap but the view is great. Prices here are about double of local places located on ground level around the city. Freedom square also called Opera square from the Opera building being located here. 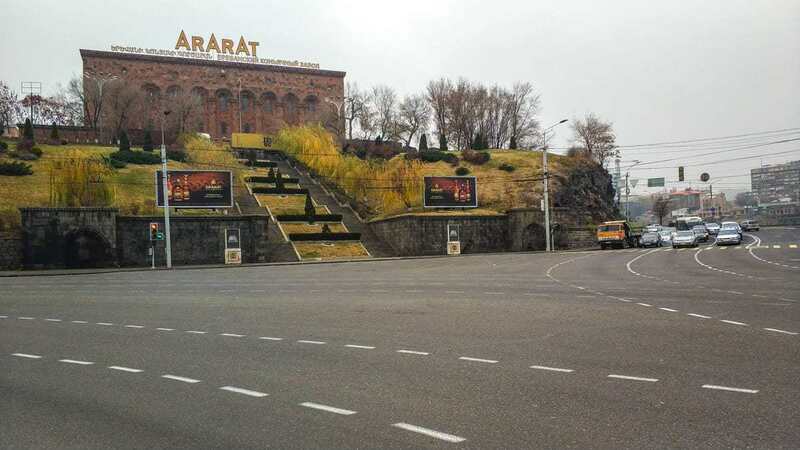 This square is located at the northern end of the north avenue, which is the main shopping street in Yerevan. The Opera was open back in 1930 and can hold up to 2600 people in two different halls. 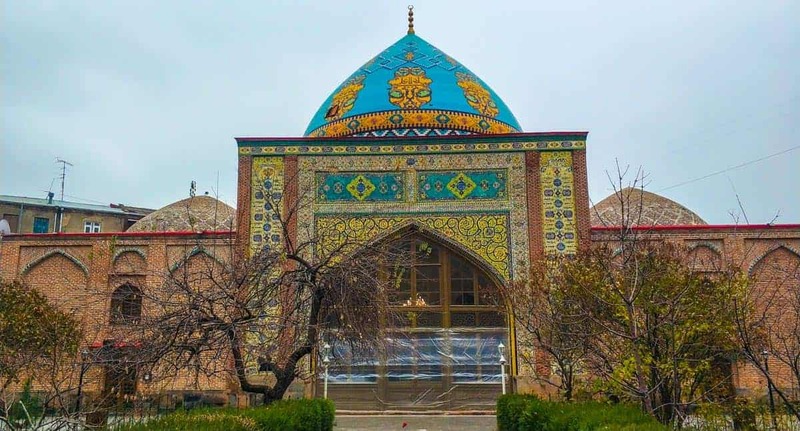 The 18th century Shia Islamic Mosque, one of the extreme few surviving structures from Islamic culture during the Soviet era. The mosque was forced to shut down in 1931 during the Soviet era. It was used as Museum of the city of Yerevan during that time. It´s currently the only active Mosque in all of Armenia. The Blue Mosque in Yerevan, The only Mosque in Armenia. 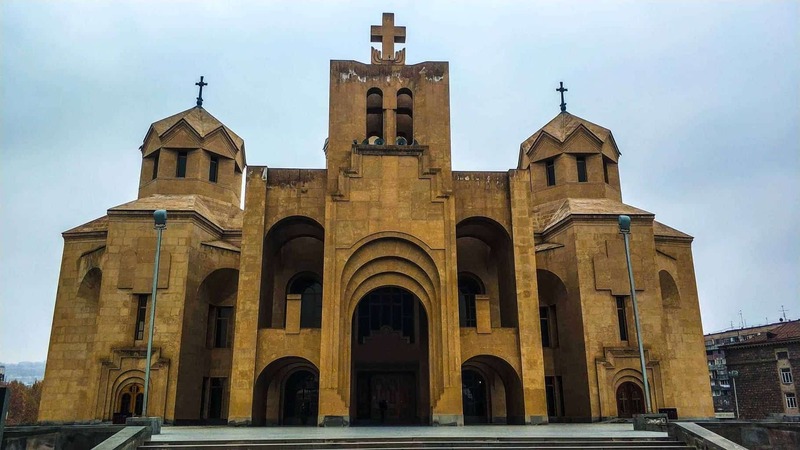 Since Armenia was the first country in the world to become a Christian country, there is no surprise that churches are almost “everywhere” around Armenia, and so as Yerevan. The St Gregory the Illuminator Cathedral is the biggest (maybe?) Cathedral in Yerevan, It´s not an old Chruch, it was only completed back in 2001 to celebrate the 1700th anniversary of Armenia as a Christian nation. The holy relics of St Gregory the Armenian were given back to the Armenian Church by the Vatican in 2001 and placed in this cathedral. The St Gregory the Illuminator Cathedral. Armenia’s biggest pride (except Christianity) is Brandy! The Yerevan Brandy Company was founded in 1887 and is said to have been Winston Churchill favorite liquor. The Museums offers two hours tour about the history and the process of brewing, and in the end, you can try free samples of the exquisite Brandy. PS: Show up at the door is not acceptable anymore, you need to prebook the tour through their website now. The Brandy Museum in Yerevan unfortunately so didn’t I know that I had to book the ticket in advance. Like in “every” other country in the world, craft beer is the big thing these days when it comes to drinking, so as in Yerevan. 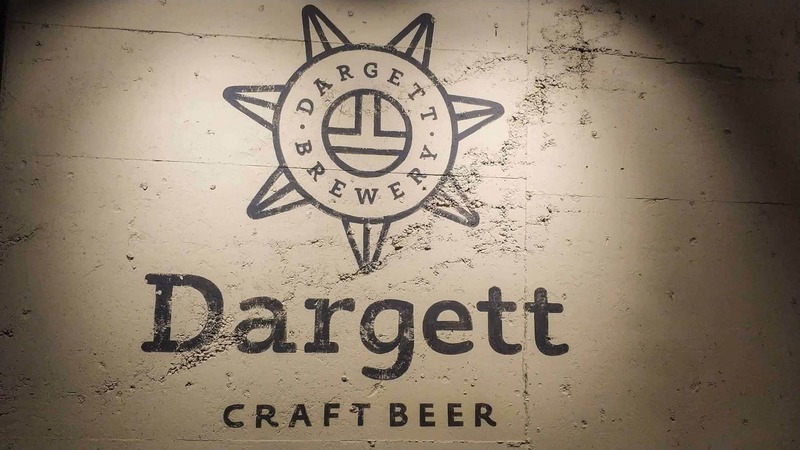 And the place to go is Dargett Craft Beer, Armenia´s first craft beer. 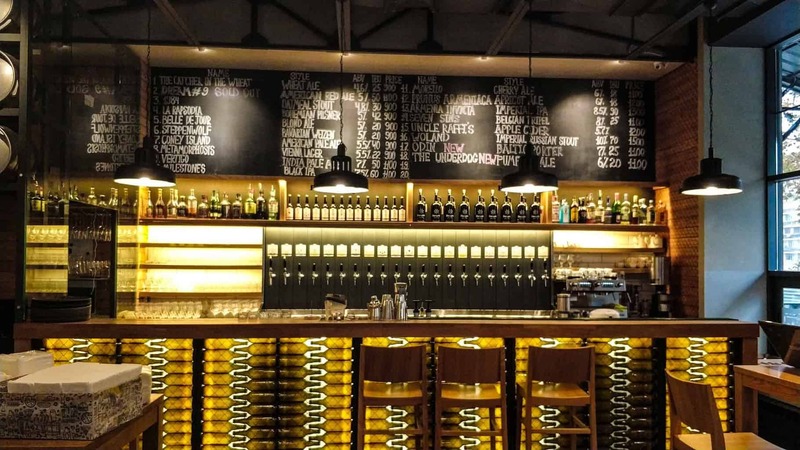 With more than 15 beer crafted on the spot and some Belgium imported craft beers, this place built a beer heaven for every beer nerd like myself. Plus food here is also great. The Var at Dargett Craft Beer Brewery. 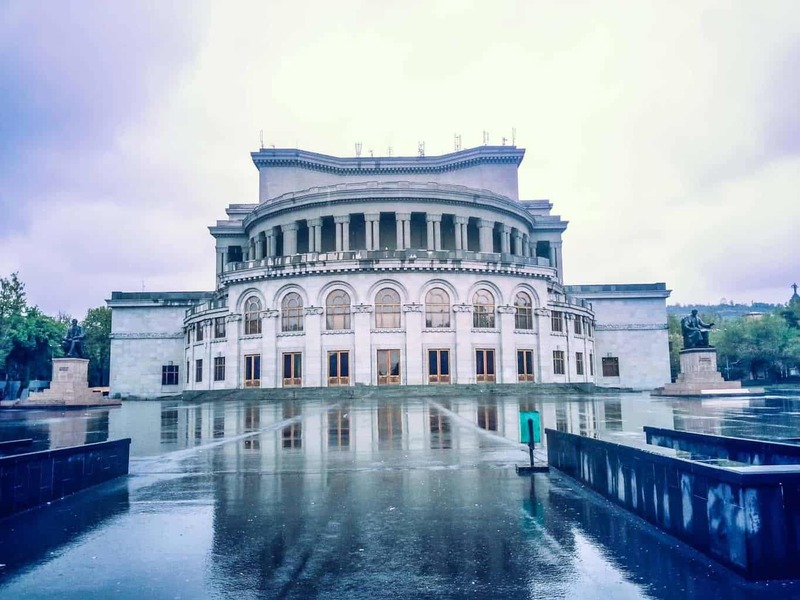 Armenia is a small and compact country so everywhere in the country can be visited on a day trip from Yerevan, either with one of the numerous travel agencies around the city or your own with either public transportation or hiring your own car, all three options are very reasonably priced. Even on a low backpacker budget. 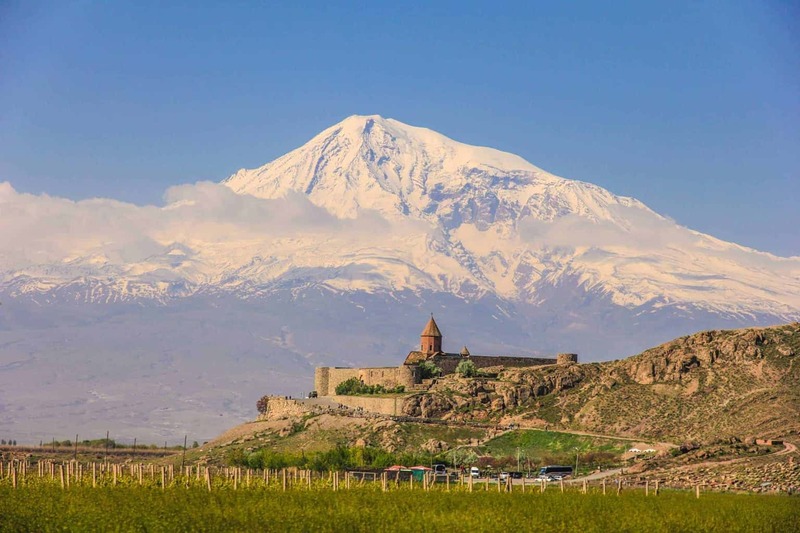 The easiest and shortest day trip you can do is to take local transportation to Khor Virap Monastery with the footsteps of Mount Ararat, the mountain where Noahs Ark stranded according to the bible. Khor Virap Monastery in front of Mount Ararat, the mountain that Noha´s Ark is supposed to have stranded. Bus 201 leaves from right outside the exit door on the ground level. It departs every half hour between 7 AM and 22.00 and every hour between 22.30 to 7 AM. 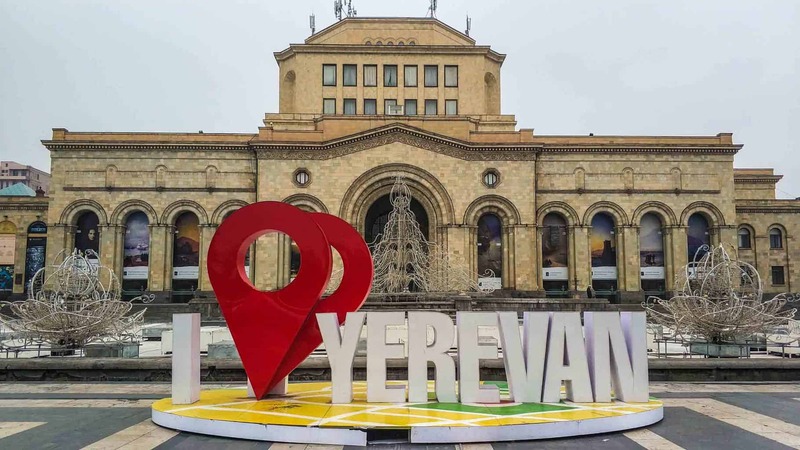 It stops at Yeritasardakan Metro, and at the intersection between Abovyan and Sayat-Nova, at Republic Square, Amiryan Street, and on Mashtots Avenue (Pak Shuka). The price is 300 Dram (0.6 USD) it´s recommended to have small change. P.S There´s free wifi on the bus. A prepaid taxi from the airport will cost you 3000 – 4000 Dram to the city center. Yerevan the capital of Armenia and by far the biggest city in the country, it has come along way since my first visit there in 2013. Now when I was back here again in December 2017 for a short visit, it was a great joy to see how much the city has improved. It´s now a great option for a long weekend trip together with Tbilisi the capital of neighboring Georgia. Great post! My partner got sick in Yerevan and we ended up having to stay a lot longer than we planned, 10 days in total. Honestly, it was a great city to get stuck in! Did you make it to the old GUM Market? Watching the ladies make their lavash bread was a highlight for me.